There is a dearth of information out there regarding yeast handling and probably as much misinformation. 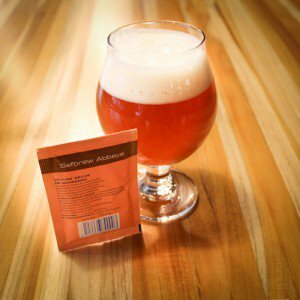 Some brewers are still under the impression that dry yeast is inferior to liquid yeast. As we mentioned in a previous blog post, the quality of dry yeast now is equal to liquid yeast in almost all cases. Another point of discussion centers around the issue of rehydrating dry yeast prior to use. Most packages of dry yeast recommend rehydration, but many brewers (myself included) have had luck direct pitching, so is it necessary? Which is better? Well, dear readers, like all things in the world of brewing (especially those yeast-related), the answer is "it depends". The idea behind rehydrating dry yeast is that it reacclimates the cells to a liquid environment. In their dried state, yeast cells are dormant, which is ideal for storage but not for fermentation. Hydrating them "wakes them up" and this, in turn, allows the yeast to ferment with less trouble. However, as dried yeast reconstitute, their cell walls lose the ability to regulate what passes through them, so at nonoptimal temperature ranges, the yeast can actually leach their innards through their cell wall. Sounds gruesome. And it can be. Hydrating at temperatures which are too cool can reportedly cause 60% loss in viable cells. That's a massacre. Given the potential problems, and the slight hassle of rehydrating yeast, direct pitching seems like a no-brainer. Unfortunately, there are problems associated with this method as well. As we learned, yeast do not have the ability to regulate what passes through their cell walls as they come back to life. The same holds true when yeast are introduced directly to wort. Sugars and other compounds are able to pass into the yeast cell, killing it. For this reason, direct pitching is not an ideal situation. A loss of 30% in viable yeast cells, possibly more, could be the result. So what's to be done? Well, it depends, of course. In my opinion, rehydrating yeast properly is the best practice, but it does take some precision. Yeast need to be hydrated between 95 and 105 degrees (it varies by strain and manufacturer) and it needs to be hydrated in tap water with some hardness. None of this bottled/filtered crap. Just good, old fashioned, American tap water. Distilled or filtered water will decrease cell viability. In high gravity beers or lagers, rehydrating at the proper temperature and slowly cooling (to avoid temperature shock) is the best way to get viability, and these types of beers are where it really matters. On the other hand, because of the relatively thin margin for error, in average or low gravity beers, where some cell loss is acceptable, direct pitching is the easier and more practical approach. Most standard 11.5 gram packs of dry yeast contain over 200 billion cells, which is plenty. These cells are also produced with lipid and nutrient reserves which help encourage yeast reproduction, so some of you may be thinking about making a yeast starter to mitigate cell loss during direct pitching, but the nutrient loss that occurs in a single stage starter will probably see you breaking even, at best. I would also advise against this. Pitching an extra pack of yeast is much easier and far more effective. In short, rehydrate to get the most out of your yeast, when necessary, and if you're gonna do it, do it right. Yeast is fragile, but it does so much for us, a little pampering here and there isn't too much to ask.